I'm always a fan of purchasing big ticket, never-go-out-of-style items at the end of the season. 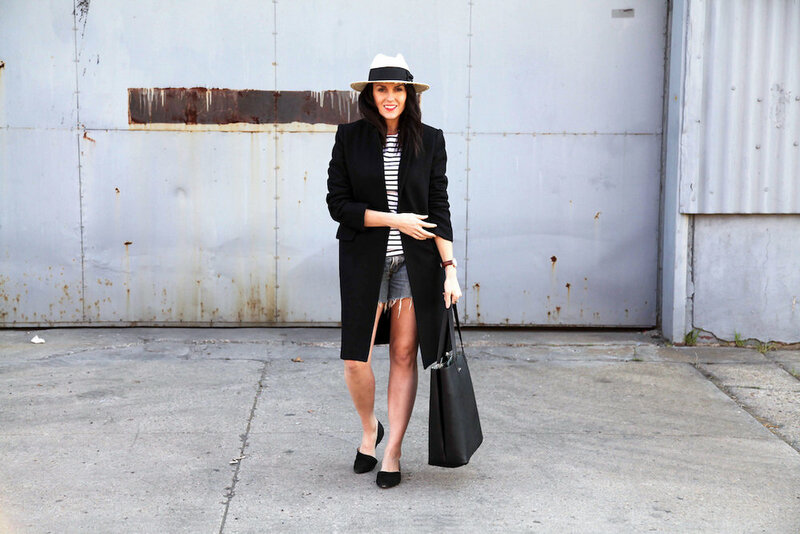 It helps me save some big bucks on closet staples and it takes pieces from out-of-range to in-my-closet. The downside is sometimes having to wait a whole season before putting said item to use. Orrrrrr, you can just get super creative and mix and match seasons like it ain't no thang. Such is the case with today's outfit. I'd had my eyes on the brand Zady for quite some time. They're total fashion game changers and I couldn't possibly love what they're doing anymore than if it was my own business. After debating on this jacket for pretty much an eternity, I saw it go on sale and knew it was a sign that I needed to buy it. Upon receiving the coat, I squealed with delight before mentally kicking myself for waiting so darn long to get it. It's truly a classic thing of beauty and so well made. I know I'll wear it until it wears out. Because of our weird winter-spring weather, I've actually been able to wear the coat quite a few times already. And while I'm all for the recent warm temperatures, I'm not even going to deny it, I just don't want to put this coat away yet. So I haven't. The other day I even threw it on over my favorite striped shirt and denim cut-offs and called it a day. 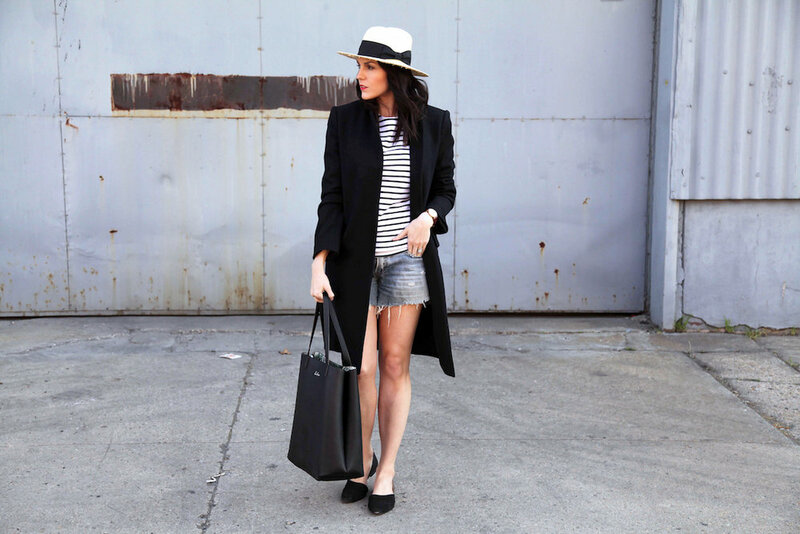 Denim shorts might not be the first thing you think to pair with a wool coat, but ya know, YOU DO YOU! P.S. 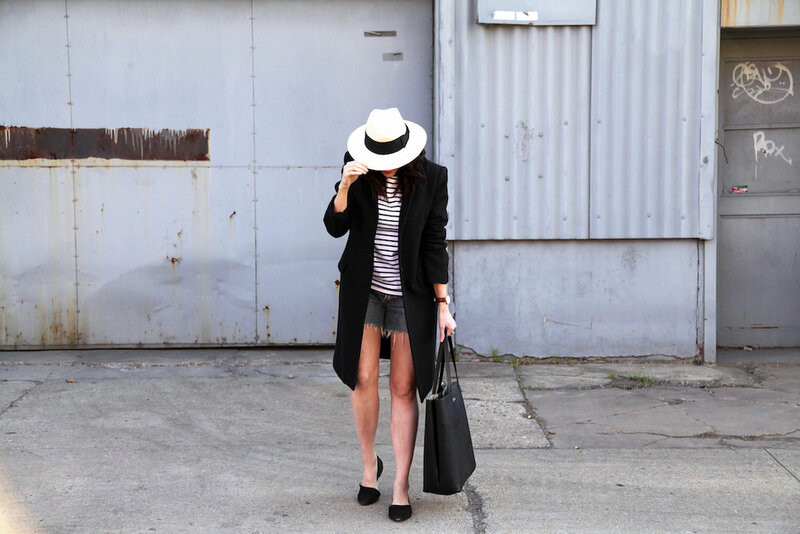 If I'm still wearing this coat in June, please someone come save me from the self-induced sauna I've most likely put myself in, and ya know, maybe make me put the coat away...at least until September.